Pooja Bumper Lottery BR 58 draw is conducted most grandly with exciting cash prizes. The person who won the First prize will get a prize cost Rs. 4 Crore. The Second Prize cost Rs. 50 Lakhs for 5 tickets. Similarly, the Third Prize is 5 Lakhs for 10 Tickets. 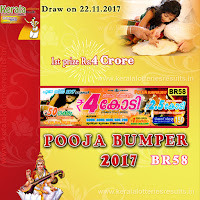 Kerala lotteries department started the sale of Pooja Bumper 2017 BR 58 Lottery Tickets and you can purchase tickets from Lottery agents across Kerala. The Prize of Pooja Bumper Lottery ticket is RS: 150/- rupees only. A total of 45 Lakh tickets are issued for sale. Buy Kerala Lottery Tickets and Win exciting prizes. Official Result available from 03:00 PM on wards. Pooja Bumper-2017 Detailed Prize Structure: pooja bumper 2017 (br-58) result details, prize structure, agents commission, draw places etc. are listed here below. Those who are taken the kerala government lottery, keralapooja bumper br 58 lotteries can check result of br58 when it is declared. (www.keralalotteriesresults.in) Among all the Kerala State lotteries, 58th bumper is the Pooja Bumper Kerala Lottery. 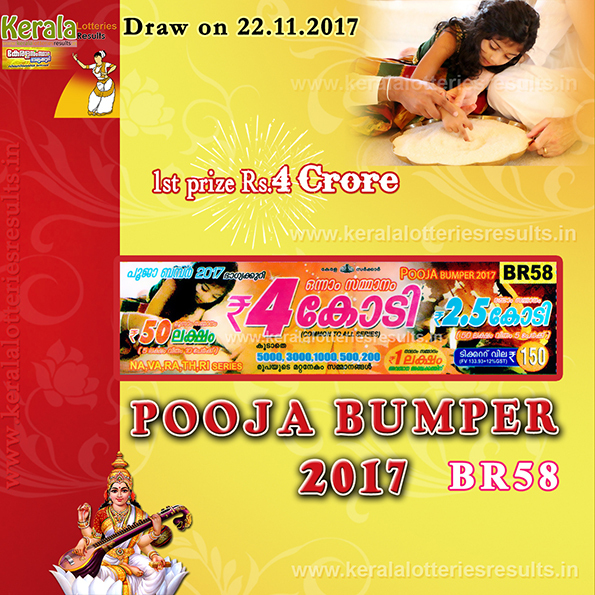 Pooja Bumper BR 58 lottery result 22-11-2017, pooja bumper lottery wednesday result 22-11-2017, 22.11.2017 Pooja Bumper br 58 Lottery Result, poojabumper Lottery Result Today BR 58 (November 22, 2017), Kerala Lottery Result TODAY, Pooja Bumper Lottery Result TODAY, Todays Lottery Result, POOJA BUMPER BR-58 Lottery Result, Pooja BR58 Lottery Draw Result, Kerala Pooja bumper Lottery Result 22/11/2017.